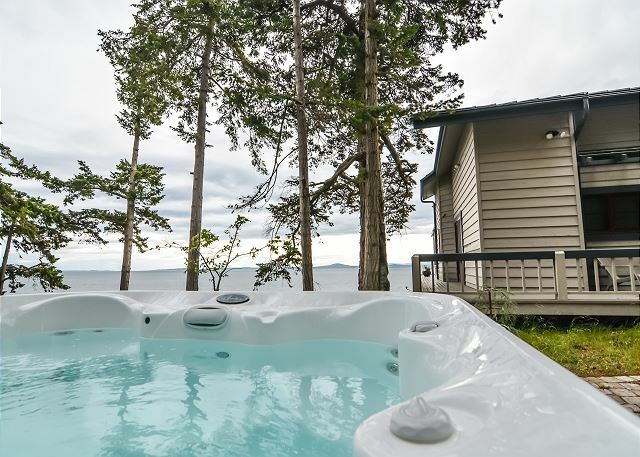 San Juan Island Vacation Rental - Waterfront, Whales, Hot Tub, Sunsets, & Dog Friendly! Vacation rental house. Sleeps 10, 3 bedrooms, 3.5 bathrooms. Dogs allowed. Welcome to Seas the Day! Expansive decks welcome you to one of our most beautiful properties. Take in the view and the sound of the ocean lapping at the shore just below your feet. Yes, you're really here and you are about to have the time of your life. The decks overhang the water as if you were on a cruise ship. The views of the sea, mountains, and wildlife will take your breath away. Hot tub anyone? You're going to love soaking away the aches after a day of exploring the Islands. Welcome inside! This sun-drenched living room allows you to enjoy the comforts of the indoors while still experiencing the beauty of the setting. The cozy living and dining areas include a fireplace. The kitchen is spacious, modern and well equipped. Looking for a calm and quiet spot to read or watch some TV? There is a comfortable, well-appointed den waiting for you. Beautiful wood floors provide warmth to an already wonderful, main-level master bedroom with immediate access to the surrounding decks. This charming sunroom is just off the master bedroom. The master vanity has a view through to the sunroom! This cozy upper loft is a great spot for activities. Whether you're a kid or just a kid at heart, there is something here for everyone including a foosball table. The guest rooms are just as cozy and inviting as the rest of the home. 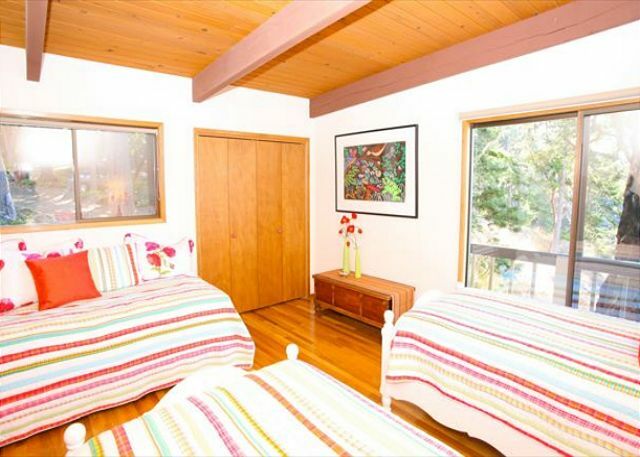 Two twin beds plus one trundle bed in the third bedroom. Sometimes a hot tub isn't enough. In that case, experience the ultimate relaxation in the sauna/steam shower. The property is perched on a rocky outcropping, right above the water. At Seas the Day you will experience the magic of sea views you have never seen before. Every day. WHALE WATCHING WATERFRONT VACATION HOME ON SAN JUAN ISLAND! You’ll experience the San Juan Islands vacation of your dreams in this absolutely beautiful waterfront rental home built right at the edge of the sea. 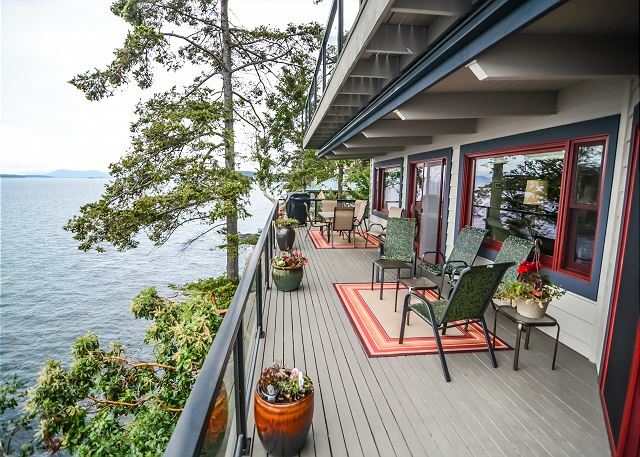 This premium west side San Juan Island location features fantastic views over the De Haro Straits. You will spend many hours mesmerized by the sound of the waves, panoramic vistas, glorious sunsets, and the seasonal joy of watching Orca whales pass right by your windows. The kitchen, living, and master bedroom all focus on the spectacular vista of deep blue water, snow-capped mountains, and Vancouver Island where the lights of Victoria BC twinkle at dusk. There's a special niche for all in this gorgeous home. You can worship the sun and dine on an expansive deck twenty feet from the water. On the main level, comfy sofas and chairs will beckon you to converse in the cozy living room by the wood burning fireplace. Around the corner, is a small wet bar and den with overstuffed leather seating. The kitchen is well equipped so you can create an excellent meal, a portion of which might be prepared on the new BBQ on the adjacent deck. 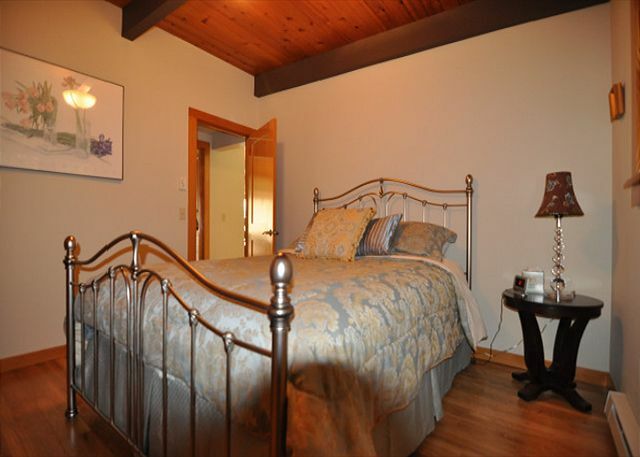 The three bedrooms are all on the main floor and feature soft linens and very comfortable beds. The master has a walk in closet, en-suite bath with jetted tub, its own TV and a gorgeous view as well as a private sun room. A second bath is shared by a guest bedroom with a queen bed and the third bedroom that offers two twin beds and a trundle bed. 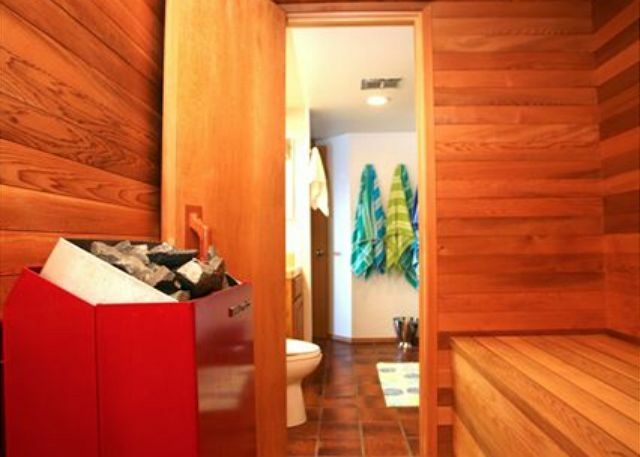 A powder room and laundry room are also on the main level. Overflow guests can be accommodated on a sleeper sofa and window seat bed on the upper level, where there is also a TV, Foosball table, and bath with steam shower and dry sauna. There is access to a private viewing deck on this level as well. Within a five minute stroll can be found a secluded pocket cove designated for local neighborhood use only; a beautiful and private place to picnic. 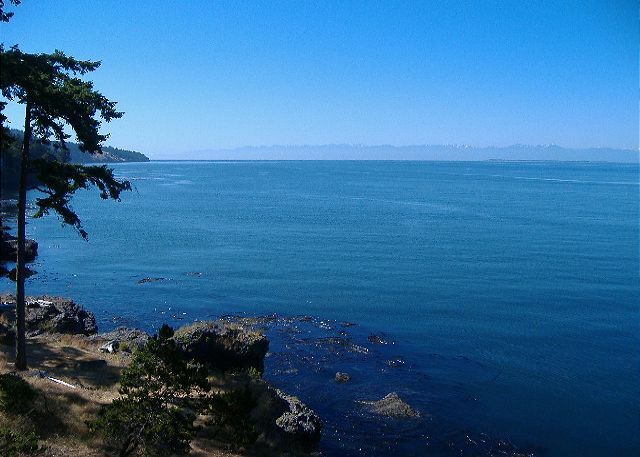 Seas the Day is also near San Juan County state park (a great place to launch kayaks), as well as Lime Kiln Park and conservation lands that are woven with hiking trails. When you come home after a good day of exploring all the Island has to offer, a hot tub (only during peak season, otherwise a $300.00 charge + 2 weeks notice during off-season to have hot tub available) will be waiting where you can soak under star-lit nights and watch the cruise ships go by. Please Note: The Hot Tub is NOT available in the quiet season. The home is dog friendly and great for families, but due to the high bank and deep water exposure, children and pets require very vigilant supervision. Please note that the house is for sale and an agreement to allow a Realtor to show that house with 24 hours notice must be signed before renting. What a marvelous experience at Seas the Day. The sunsets were beautiful and the peaceful nature of watching Bald Eagles, Orca pods, seals and their pups were a thrilling part of our wondrous family experience. Watching kayaks, fishing boats and ship float across the horizon created a serene experience for the entire family. I understand that this particular property will no longer be on the rental market, which is sad because it is a beautiful location and there was room for our family of all ages to spread out. Everything was as described and our stay was fun! Coffee on the deck wrapped in blankets was a highlight of our trip. We loved Roche Harbor, though Friday Harbor feels very touristy. The water here tastes terrible, so be sure a pick up a huge jug at the grocery store!! The local supermarket in Friday Harbor is the place to go to stock up; we wasted a lot on other grocers in the harbors. Try San Juan Pizza, take and bake. Delicious!!! We were very pleasantly surprised. The home is quirky but cool, and the views are unbeatable. The location was perfect for our guests and 2 dogs. Sunsets were fantastic. It's a little dated but house was clean. The deck has a lot of bees so be careful if allergic or don't like bees. Our family of nine, including grandparents, moms and dads, and three, pre-school grandkids, spent a wonderful week together at Seas the Day in August. One of the many highlights was watching orcas right from our deck! Another favorite was dressing up like pirates and hunting for buried treasure down at the little private cove. The house provided ample room to spread out as needed but also made group dinners and playing music together comfortable. The kitchen was well stocked with every appliance, the beds were comfortable and the four bathrooms were a luxury! Sunsets were spectacular and the ever-changing view of the ocean kept us all entertained. We ventured out for day-trips to South Beach, Roche Harbor, The Sculpture Park, the Farmers Market and the County Fair. Some in our party, experienced kayakers and cyclists, would have liked access to kayaks or bicycles without having to sign up for a guided tour with the rental agencies. Maybe the management would consider making these available? The week went fast and we loved every minute. Smugglers Cove is definitely a place we'd all like to visit again. We enjoyed our stay at Seas the Day. It is a spacious home with a beautiful ocean view. We were fortunate enough to see Orcas from our deck! It is an easy drive to Friday Harbor or Roche Harbor- you definitely will need a car though. Unfortunately, the electronics in the home did not work so we were unable to enjoy a movie or the news after long days outdoors. There was no compensation offered for the lack of working equipment. We rented both "Seas the Day" and "Haida House" for our family reunion. There were fourteen of us, with 8 in "Seas the Day" and 6 st Haida House. Both groups loved their places. The only drawback was that the two places were further from each other than we would have liked. At "Seas the Day" we were especially happy with the gorgeous sunsets, its proximity to Lime Kiln Point, and the bald eagle nested in the tree right over the house! The home is beautiful with plenty of space for the party of 8 we had with us to stretch out. We spent a ton of time out on the decks and cooked in every night (plenty of utensils, etc, in the kitchen). What a beautiful view, great neighbors and super easy access to everything else on the islanf. Great stay at Seas the Day! Our stay at this rental was wonderful. The location was excellent and the view alone was worth the price of admission. We saw some gorgeous sunsets from the large balcony. The house was comfortable and very well equipped. Kyle and the rest of the staff at San Juan Vacation Rentals were very kind and extremely helpful. Would recommend this rental to everyone. The rental was fantastic. Great views just as advertised, lots of space. Loved the two different living room areas so our group could have two different activities at once. Beautiful, peaceful location. Private setting with plenty of space for our group of 5 adults and two dogs. 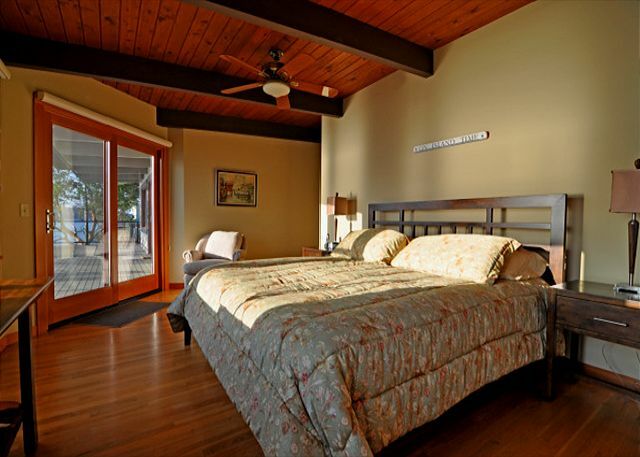 Master bedroom looks out over the water and seeing the view upon awakening everyday was wonderful to experience. The kitchen was well equipped for cooking all meals. The living room area and loft above were nice gathering places with fireplace and wood stove. The hot tub was broken which was a big disappointment to the people in our group. No one responded to our request to fix it but we were refunded a small portion of the rental fees. We forgot a jacket and when we inquired about it the property manager priority mailed it to us the next day, which we really appreciated. The house was very clean and well heated. Our extended family (6 adults, a 2 year old and our dog) spent a long Thanksgiving weekend at Seas the Day. We spent a lot of time indoors so we fully utilized the house: the kitchen was fully stocked with utensils, pots, pans and accessories that fully supported our frequent dining; the dining area was good for our group but would have been tight if we had additional people in our group; the master bedroom, shower, bath, walk-in closet was spectacular with a great view across the strait to Vancouver Island; the other 2 bedrooms were quite ordinary; the TV and fireplace areas were a bit small for gatherings; the upstairs room was nice but hardly used because it was away from where people gathered (would have been a good place for teenagers! ); the steam room and sauna were a nice touch as was the hot tub (even though it was across the driveway). The setting for the house was spectacular with the views of Vancouver Island, frequently passing ships, occasional sea lions and churning surf during stormy weather. Stores were about 20 minutes away but nothing is really far away on San Juan Island. We enjoyed hiking in Limekiln State Park and Cattle Point along with visits to Roche Harbor and Friday Harbor - all picturesque! The view was amazing!! Very relaxing trip and celebration of my Dad's 60th birthday. Absolute breathtaking view with lots of whale sightings. Home was clean and very nice. The home is in a wonderful location, easy to get to and easy to town. We loved the home, it is well stocked, loved the views! We saw 2 gray whales right off of the deck all day long!We saw also porpoises every day, make sure you really pay attention because those little buggers are fast! I could go on and on because it was amazing and worth it. This is an outstanding house with a world class view up and down the strait. Whether you are inside or out you have the same amazing view. Daily we saw bald eagles swooping around the house and resting on nearby trees. The house is very comfortable with nice kitchen and dining area. The master suite is truly great. Can't say enough nice things about the house. The location is a bit off the beaten path but that makes it very private. Best view on San Juan! A group of 9 adults celebrated my husband’s 40th birthday at Seas the Day. We had 4 couples and 1 single friend. We had a great time and surprisingly spectacular weather for a weekend in late April. Hardly a cloud in the sky, we could see the Olympic mountains and Vancouver Island. The views are over the top from the decks. The house was pretty well appointed. We found the layout slightly awkward for our group. One of the couples and the single stayed in the room with three single beds, but it worked. There wasn't enough dish washing soap, paper towels, trash bags, etc. We ended up having to buy some. I think for the price, they could have a larger stash of all of the necessities. It was in a great location on the island, about 15 minutes to Friday Harbor, beautiful drive. We saw whales, seals, sea lions, bald eagles and dolphins from the deck. The only downfalls in the house were the dishwasher was hard to figure out since some of the buttons were missing their description, the master bathroom lights didn't work upon first arrival (had to flip the breaker), the bathrooms in general I would've expected a little higher end or some updating, part of the side deck was roped off (looked like some repairs were needed), the pots on the deck were not planted... the annuals were sitting on top and dried out quickly. Artwork around the house, strange! Overall, the house was really good, we would go back. Stayed at the house with a group of friends reuniting from all corners of the world. We had a fantastic time in this house, beautiful location and scenery. Saw a pods of whales several times from the deck. The house was in great order and had more amenities than we were expecting, with a setting more breathtaking than can be described. Had a little mix up on locating some sheets for the pull out, and they were very responsive in helping to sort right away, which was much appreciated. Absolutely wonderful! This property looked great in the photos and did not disappoint in any way. It was well equipped and very comfortable (although we did not use any of the TV's all week... the show was outdoors, with frequent Orca traffic!). This home is a good fit for adults and non-mobile youngsters. The home sits on top of a 30 ft cliff so caution is certainly in order if young explorers are in your group. The house was spotless on arrival and the information binder was very thorough. We appreciated little things such as light switches labeled to minimize confusion. The views here are nothing short of spectacular. This house was very well conceived to maximize the location. Commonly used areas generally have a water view. The sunroom off the Master Bedroom gets the morning sun and is warm and wonderful place to enjoy morning coffee and a good read. 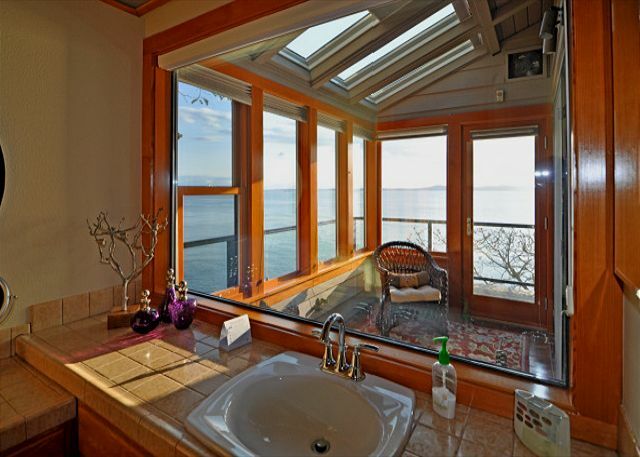 The master bath even looks out through the sunroom to the water. The main deck is positioned so you can sit out near the rail or tuck back in from a southerly breeze and remain with a protected clear view of Haro Strait. We had our daughter, son-in-law and infant granddaughter along with us. They moved into the loft area and made that their private suite. The loft does not open onto the main floor except for a wide doorway at the top of the entryway stairs, leaving it very quiet and private compared to most open lofts. The fact it also has great ocean views and a big deck are an added bonus. We would happily return! Home away from home---only better. I have been here four times and will be back next year!! A perfect house and location. The Vacation Rental staff was great!!! WE had an excellent time, saw J pod as well as porpoise, seals, sea lions and bald eagles from the deck. The house was comfortable for our family group. Had a problem with hot water on Sunday of our stay and someone came out immediately to fix it. Great service. We had a great time at Seas the Day. The view from the deck is awesome. We saw Orcas, eagles, otters, seals, deer and many different birds. The lights from Sidney at night are magical and watching the ships passing by was really cool. The kitchen was well appointed and had everything we needed. There was a nice propane BBQ as well as a spare tank of propane. A good selection of spices and seasonings are included in the kitchen which was a plus. We had 6 people and everyone had a comfy bed and slept well. The master bedroom is big and has a walk in closet and great bathroom. A sun room is attached and the views from the bed are nothing short of spectacular. My wife and I stayed upstairs on the pull out couch and that was actually comfortable. Really. We enjoyed going to the private beach down the street at all times of the day. Sitting there watching orcas swim past is an amazing memory of our time at Seas the Day. It is a short drive to town (15min.) and close proximity to Roche Harbor. The fine folks at Vacation Doorways were very helpful and took the time to make sure everything went well. Thanks Linda! We would love to come back to Seas The Day and spend more time. This is a beautiful home and we enjoyed being there very much. We called the property management company on day 1 of our 7 day visit to inquire about trimming the hedges that had grown so high they obscured the view of the water from the deck. They sent someone out right away, who took pictures and then we never heard from anyone again. In the picture shown, the bushes/hedges are now at or above the rail in some places, so when you're sitting or dining on the deck, you can only see the water at the horizon level, not down below or closer in. Of course the view is not obscured from the 2nd deck upstairs, but it's not always convenient to haul food and drink up there. We rented the house to spend some time together as a family to celebrate my parent's 50th anniversary. The house was lovely, the view incredible and we were treated to three orca pod sightings. The kitchen had everything we needed for putting meals together and we enjoyed having the grill to use, as well. We all agreed that we would love to come stay again sometime. It was nice to be on the quiet side of the island. boat trips,our 6 adults and 3 kids really loved the house...2 suggestions: the master suite mattress is very tired and should be replaced...for older folks it would be nice to have a railing on one side to get up and down steps to kitchen...overall:tops just tops! My family loved Seas the Day. The home was very neat and clean and what a view from the deck!! Wow!! We saw orcas every day from the deck and also eagles. None of the family wanted to leave--it was so relaxing. Large Beautiful Home, Clean & Comfortable, Well Maintained, appropriate decor, fantastic view-every day we saw the Orca Whale activity from the decks as well as many assorted ships, night view of Victoria, excellent kitchen with new appliances and an abundance of dishes & cook-ware. Many attractions close to Sea The Day!!! My family stayed here for four nights at the end of June. There was 11 of us staying here including two young kids and two small dogs. Overall we had a fantastic stay. The view was spectacular! We saw Orca whales pass by the house on average twice a day as well as other wildlife including a bald eagle, a few seals, jellyfish and humming birds. We saw the sun set over Vancouver Island and at night we saw a zillion stars in the sky, including the Big Dipper constellation. The house itself was well furnished if not a bit over furnished. My family utilized almost every corner of the house. We quite enjoyed listening to music on the old-school turntable. The only critique I have is that I think the house could benefit from a deep clean. We found a lot of expired or empty kitchen condiments left in the cupboards by past guests. And, we found a lot of moths living in the loft including inside the never used hand-towels hung in the bathroom. Despite those minor flaws I would enthusiastically recommend this rental to any friends and would absolutely stay there again myself. Future guests might note that this booking was accepted with the expectation of 9 guests in residence; we did not authorize 11 guests during this stay. Children and infants are counted in the maximum number of guests accepted. The house is well equipped and comfortable. The deck has amazing views of Haro Strait. The master bedroom suite is fantasctic. WOW what an amazing 5 days we had. The house was to die for! Beautiful, large, expansive views from every room of the water, and just perfect! Two of our days we watched the whales swim by right in front of the house. The house could not be closer to the water. 180 degree view all up and down the coast. Weather was perfect - sunny and comfortable durning the day and cool at night. Can't wait to go back. The house is lovely and sits right on the edge, and I mean edge, of a cliff. The windows are huge and every room on the west side has super views of the straits. Ships, seals, jellyfish, herons, eagles and kayakers are regular sights. The furnishings are very nice and comfortable...like you are staying at a friends home...not sterile and sparse. There are loads of personal touches including vinyl records and a record player! The only drawback was the water issue so we had to drink bottled water the whole 10 days we were there but they supplied most of the water. The other was the house has a funky odor, like it has mold or dampness. That explains the boxes and boxes of baking soda in every available hidden area. Other than that, I would say it was very relaxing and beautiful. This house is not for kids at all because of the cliff outside. Same for dogs unless you have them constantly on a leash..which we do since ours is deaf. We did see whales. The whole J and K pods traveling together and that was worth the whole trip in itself. We would definitely go back to this house if it is still available when we return. Just prior to your arrival, a state inspection reported that the community water supply did not meet some of the required drinking water standards. It was highly unlikely this posed a serious health risk but as the neighborhood was advised not to drink water direct from the tap, we provided bottle water. We greatly appreciate your understanding of this highly unusual situation. The district is now in full compliance so that future guests will not be similarily inconvenienced. We are sorry for the inconvenience during your stay, but are happy that you enjoyed your time in the home nevertheless. Hope to see you again soon! What a gorgeous home! We loved Seas The Day! The deck was our favorite place to spend time. It was hard to leave the gorgeous view! The house was a wonderful place for a group vacation. The only problem we had was that the kitchen lights were on a track lighting system and they went out. When we called about it we were told that they couldn't be fixed so we were without lights in the kitchen for about 4 of our 7 day stay. Fortunately the sun set late so we made it work! Great furnishings, beautiful location, fully stocked for all your needs. A wonderful getaway for any family or group! Beautiful spot with a great view. It overlooks the water in such a way that we felt like we were on a cruise ship. Wonderful views of wildlife, sunsets, etc. Adequte warning about very steep driveway is warranted. For older folks it is pretty harrowing for a walk, for fear of a fall. Our second time here. Saw orcas right below the deck, BBQ'd two nights and just had a very relaxing time. The house is very beautiful and in a wonderful location on the island. We had 10 days in the house for a portion of our honeymoon adventure. When we first arrived I called it a "mermaid castle" as it is right on the edge of the water and the house is fashioned with treasures from the sea. We enjoyed the steam room and looking out from the upper deck at the ever changing sky line and water. We loved sitting by the fireplace listening to the music that was in the cd player snuggling and reading. The kitchen was well equipped and perfect for our needs. We had the special treat of being visited by a magnificent bald eagle in the wonderful tree out the side kitchen window. We would recommend for all! We rented this house mid September for a yearly "girls" trip. The house was wonderful, in a great location right on the haro strait - beautiful sunsets and alot of natural beauty. The house was a bit more costly to rent than we normally spend, but the location and house are wonderful and really filled us with special memories. Other guidance, not specific to the house and I'm sure varies, but the whales for us were more south on the island - and we did see many but had to go on boating excurions (we went from Snug Harbor which is close to the house, 3 times!). We were hopeful we could see them pass the house, but unfortunately they were consistently south for our week - which I know is late and not prime season. And, on the good side, they were plentiful once we got to them! Overall had a wonderful time and very special trip, and a wonderful choice in location/house! This was one of the best houses I have stayed in. The setting is so peaceful and beautiful. The view is spectacular and even better we got a wonderful show of whales. Also it is well suited for all the activities we like to do, bike riding, hiking and kayaking. Plus you can just stay home and relax if that's what you like. One of the nicest homes we have stayed anywhere in the world. The house was luxurious, the views were other worldly! We are all ready to go back. We had our family of five adults and everyone felt like they had their own space when they wanted it and very nice together time. We love to cookand the kitchen was great. Location fit us perfectly. Close enough to Roche Harbor and Friday Harbor so the 15-20 minute drives through paradise were just right. San Juan Park, Lime Kiln Park, we're close and fun to visit. We hope to return soon. Linda at Windermere was a great booking agent and helped us throughout the planning and the trip! Thank you again! Nice big home with great views of the sound. We saw a pod of Orcas from the deck. The master suite is fantastic and the living areas are very nice. Upstairs loft also very nice. Other bedrooms have no view as stated. In order to sleep 10 adults, at least 2 are on a couch, not a sleeper or a window seat. Upstairs shower & sauna not working during our stay. Hot tub is not inviting. It is not on the deck, but in the parking lot, with a partial view of the sound. We didn't use it. Location very quiet. No activities, parks or hiking trails within walking distance. Amazing view, including from the kitchen! This was the perfect place for a family reunion! The kitchen is very well stocked with cooking supplies. We could not find the whip attachment for the Kitchen Aid, so we had to whip eggs by hand. If the attachment can not be located, I'd recommend a hand beater be put in the unit. The deck and hot were high points for our trip. We loved watching the kayaks and sailboats pass. The orcas were "out to sea" for much of our stay unfortunately... perhaps when we return we will see them. Amazing property! Worth all the travel time! the amenities were great, the furniture beautiful and the views were amazing! Unfortunately, the house is up for sale and we had some water leakage problems from the upstairs sauna and steam shower. I hope this house stays as a vacation rental and the leaks are fixed so we can return next year. No worries about the home being for sale - it is fully available for the 2013 summer bookings! And the shower is also fully repaired, so we hope to see you again! Seas the Day was everything and more than what we hoped for! Lovely home, awesome location and magnificent marine life.....whales,whales and more whales!!! Property was perfect. Renters should know that the only bedroom with a view is the master. The perfect environment to just be content to exist. Great house for a group holiday while still allowing each person to feel like they had their own space. HIGHLY recommended! We enjoyed our stay, especially sitting on the deck in the evening. The views were spectacular. We also enjoyed the orca visits. The orcas visited us twice. Once they were so close we could see them swimming in the water. We also enjoyed San Juan Island. 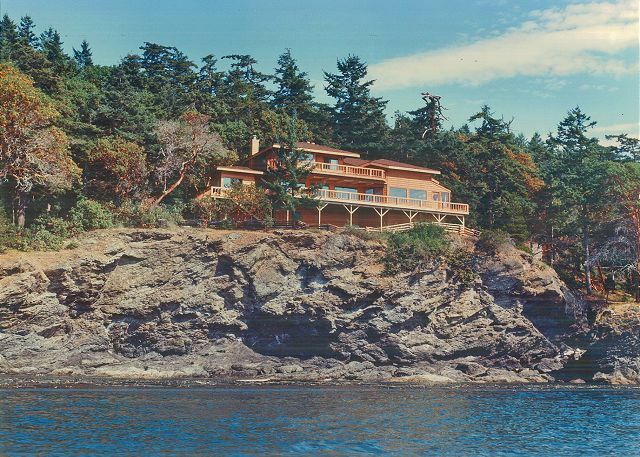 This property is roughly equi-distant between Friday Harbor and Roche Harbor. Our only complaints were that the electronics were difficult to use. We could not play DVDs for the kids, which would have been helpful on a couple of occasions. The instruction were not helpful. Also, the master bath was clean, but seemed a bit below the standard set by the rest of the property, especially the master bath shower. Nevertheless, it was a very nice property and we enjoyed our stay. We would do it again! Seas the Day was Wonderful! We were thrilled with everything about our vacation rental! The remote location,orcas whales going by everyday/sometimes twice, deer and eagles galore. It was magical for all of us! Grandchildren especially. The home was beautifully furnished, more than enough towels than we expected, and everything we needed in the kitchen! We want to come back next year! Thank you so much! We have been getting together for 25 years and this was the best trip we have had in a long time. The house was great, meals on the porch superb, the views outstanding, and the amenities first class. We were thrilled with the house and the amenities. The large deck with afternoon sun was wonderful, especially with all the whales we saw! A couple times the hot tub was not hot, but a call to a caretaker quickly resolved the problem. We would definitely recommend the house to others! We had a fabulous week in this lovely house. We saw Orcas (25!) swim past the deck one morning and watched them frolic further out a few other times. Its a bit of a drive to town, but not bad and the house is so well equipped that we had everything we needed for a wonderful week. Our only difficulty was with the TV, which had a new service and was a bit confusing. We kept losing signal. Some directions on use would be a great help for renters. But who need TV, when you've got whales?? 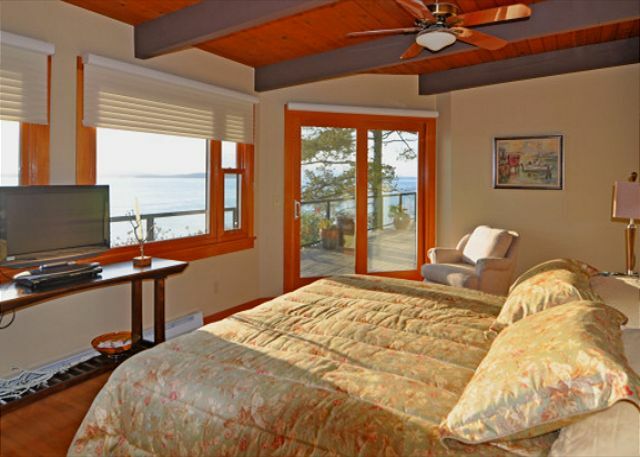 We'd recommend this home to anyone and everyone that wants a memorable San Juan Island gettaway. Overall the place and stay was excellent, the only issues was a tough time bringing a boat via trailer.